My London Heathrow-Jo’burg flight landed at 1030. The captain came on to say we were parked a long way from immigration so be prepared for a walk. It took about ten minutes to get there, with a long queue for passport control taking about 20 minutes. Once through, I had to reclaim my bag for luggage carousel ten – it had been priority tagged so didn’t take long to appear. I then exited the area, following the signs to domestic recheck – I used the business class lane, which saved a lot of time as there was only one person ahead of me (there was a long queue for economy). I already had a boarding pass for the Jo’burg-Durban sector and my case had been tagged at Heathrow so it was simply placed on the conveyor. I then took the escalators upstairs and walked in the direction of Gate D5, which is in domestic area B. A member of staff rushed to show me the way, which was helpful, but them asked for a tip. There was a security area to go through, adding more time to the process. My flight was departing at 1210, with boarding due to commence at 1140. However, in the end I was through by 1135 (laptops but no liquids out), and then made the four-minute walk to Gate D5, to the right. There was a lounge but I didn’t have time to visit it. Boarding began on time at 1140, with business class passengers given priority. Access to the A320-200 was via an airbridge to the front. There were four rows of business class on this flight with seats configured 3-3 (although the middle one is kept free). Each had grey upholstery, decent size tray tables, seat-back pockets for magazines and extra legroom compared with economy (39 inches versus 31 inches). Row one offers the most legroom and means you are able to exit the plane before anyone else and get served first. Refuelling was completed at 1155 and the captain came on to say that the flight time to Durban would be about 50 minutes, and they were just waiting for a few passengers who were on a delayed Virgin flight. We pushed back at 1215, taking off at 1245 – it was a busy time of day for the airport, with a queue of ten or 11 planes ahead waiting to take off on the runway. Once in the air, the seatbelt signs were turned off and the beverage service began (there was free alcohol and soft drinks for business passengers). The female member of crew serving me was friendly and smiley. The cabin was full. At 1255, meals were handed out – there was a nice looking tray of three slices of chicken wrap with cous cous, two skewers of mozzarella and cherry tomato in pesto, and some fresh fruit slices. But I had pre-ordered a special vegetarian meal – the main was disgusting, while the dessert (cheesecake) was quite nice. 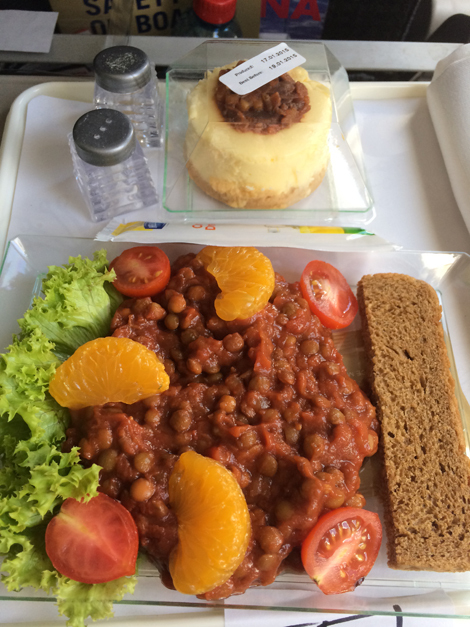 The savoury dish looked unappetising and tasted like muck – some cold mushy lentils in tomato sauce with clementine segments on top. I don’t know how it could be called food – let alone a business class meal. It was a good thing I wasn’t hungry. 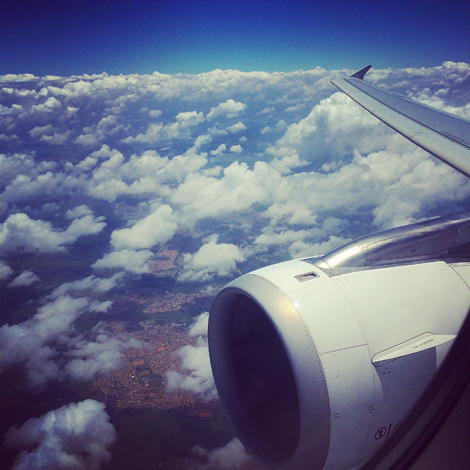 The plane landed in Durban at 1345. It was very quick and easy leaving the airport as there was no immigration to go through, and my suitcase appeared by the time I got to the carousel. My flight was delayed and the meal I was served was inedible, so it wasn’t the best customer experience. For a flight as short as this, it’s probably not worth paying the extra to fly business class, although it’s nice to have more space, priority boarding and a free drink. PRICE Internet rates for a return midweek business class flight from London to Durban via Johannesburg in March ranged between £5,790 and £6,345 depending on flexibility.